The absolute BEST Vanilla Cake and Vanilla Frosting recipes. 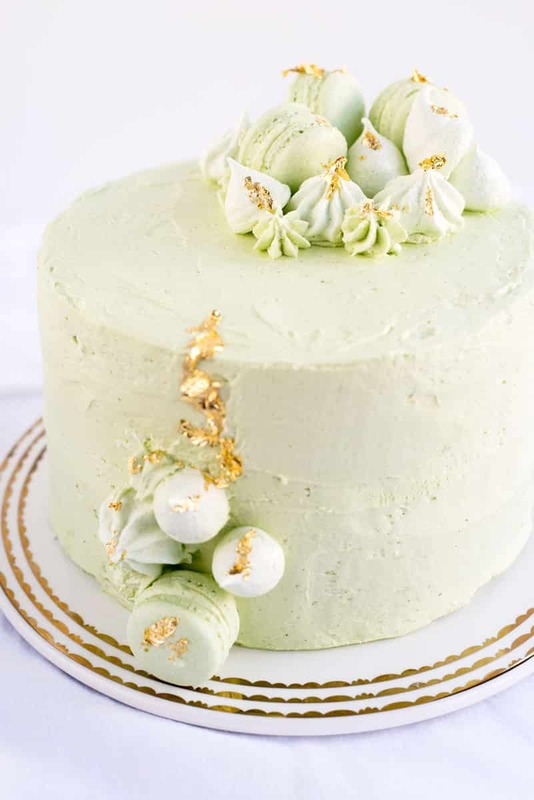 This pale green cake is decorated with french macarons, meringues, and gold leaf which makes it perfect for a wedding. I have a little cake inspiration for you today my loves! Am I the only one who gets the itch to make a cake every few months? I don’t consider myself a cake decorating expert by any means. Every cake is a learning experience for me. Every time I make one, my decorating technique improves a bit. The vanilla cake itself is absolutely heavenly. 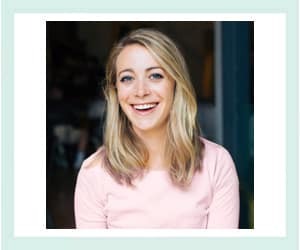 I stumbled across it while searching for another recipe. The way the blogger described it, I just couldn’t resist trying it for myself! It contains a mix of half Greek yogurt and half whole milk, which gives it a creamy flavor that doesn’t mask the vanilla. The cake uses Rose Levy Beranbaum’s reverse creaming method. If you’re like me and it’s not something you’re familiar with, you mix the dry ingredients first and then add the fat. The fat coats the dry ingredients and prevents the mixture from getting tough when you stir in the liquid. This produces a velvety crumb that is dense but still soft and delicious. The author pronounced it the BEST vanilla cake ever. I have to whole-heartedly agree! Between the layers, I used her buttercream vanilla frosting. To decorate the outside of the cake, I used the same delicious green tea buttercream that I used for these green tea french macarons. Note: This recipe is for one 9-inch layer cake. To get enough batter to make the 8-inch layer cake you see in these photos, you’ll have to triple the recipe. Also make sure to double the vanilla buttercream recipe. The BEST Vanilla Cake and Vanilla Frosting recipes you can find. 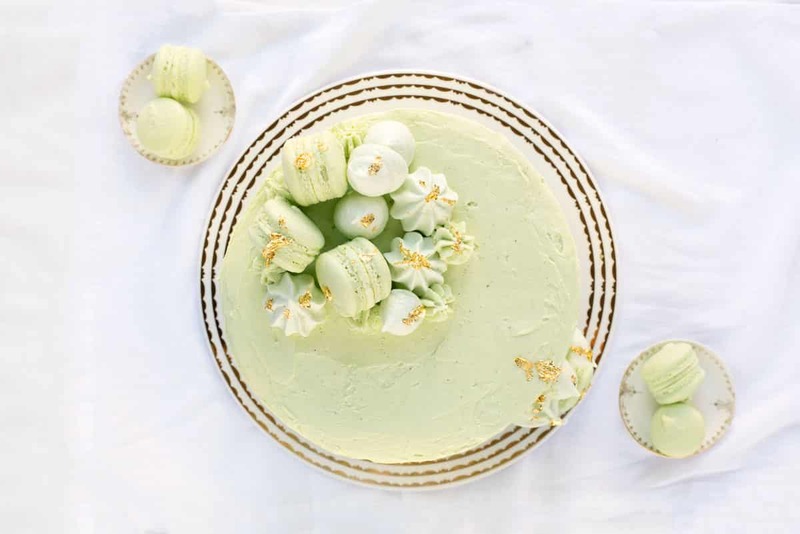 Make and decorate this pale green cake with French Macarons, Meringues, and Gold Leaf! Recipe via Brita Larson, Baking is a Science Blog. This recipe makes one 9-inch cake layer. Preheat oven to 350° Fahrenheit. Grease a 9-inch round cake pan with shortening. Line with a parchment paper round. Combine the dry ingredients in a bowl and set aside. In a second bowl, whisk together the Greek yogurt, milk, and vanilla. Add the melted butter to the dry ingredients and mix on low until incorporated. It should look like small white peas. Add each egg one at a time. Add the liquid mixture and mix on low until incorporated. Increase mixer speed to medium and mix for another minute. Do not over mix! Bake for 20 minutes, or until a toothpick inserted in the center of the cake comes out clean. In the bowl of a stand mixer, cream the butter until pale and fluffy. Add the powdered sugar and mix until smooth. Mix in milk. Cream until fluffy and add more powdered sugar to get desired consistency. Level cakes and stack, alternating cake layers with vanilla buttercream. Use an offset spatula to level. Use green tea buttercream to do a crumb coat. Chill cake in the fridge for at least 15 minutes. 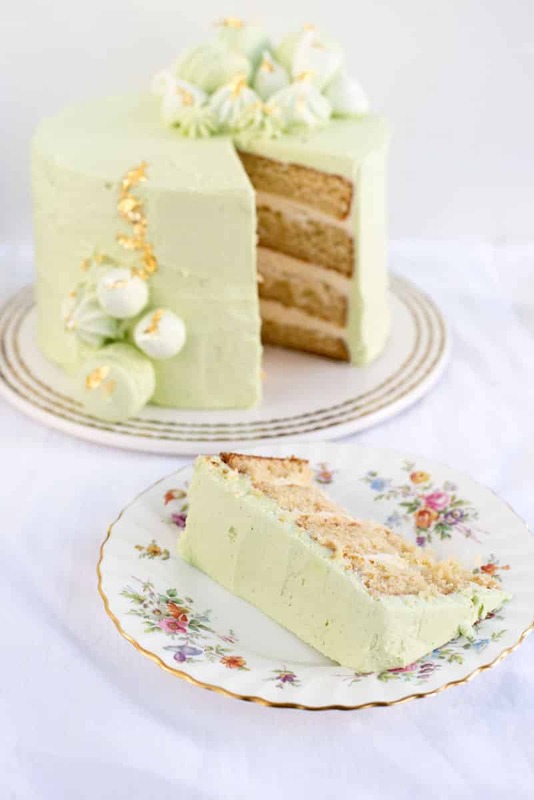 Coat the cake with a layer of green tea buttercream. 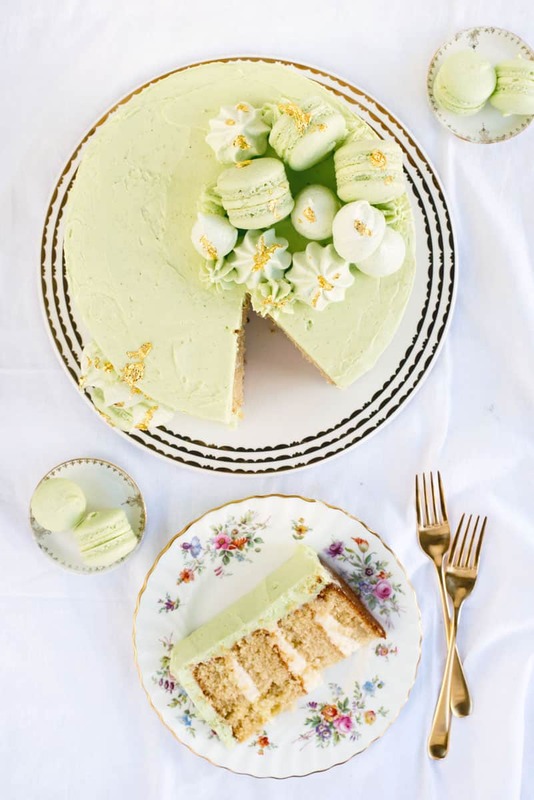 Use remaining green tea buttercream to ‘glue’ macarons and meringues to the cake in a cascading pattern. Fill in the gaps by piping buttercream stars intermittently. Use a tweezers to gently lay pieces of edible gold leaf on the cake to finish. This recipe is for one 9-inch layer cake. To get enough batter to make the 8-inch layer cake you see in these photos, you’ll have to triple the recipe. Also double the vanilla buttercream recipe. 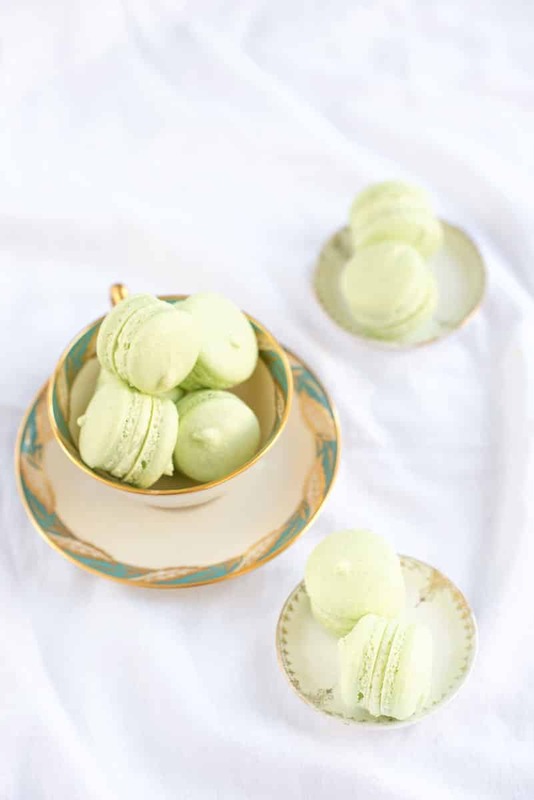 Click for the recipe to make these gorgeous green tea French macarons to decorate your cake! Oh boy ! You are great ! Your recipe, setting, plates, photos, just everything ! Great ! Keep on rocking ! Haha, thanks so much! I really appreciate it. This cake looks perfect. I want it for my next birthday.